When we treat the groin or armpit, the skin is thicker than large body areas, so the Intimcare serum's active ingredient concentration is higher. 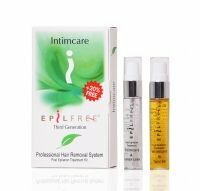 INTIMCARE is formulated especially for the intimate areas of the body. These areas are a different type of skin than other parts of the body and require Part B to have a little higher concentration of the serum's active ingredients. The INTIMCARE permanently reduces unwanted hair without laser. The ingredients soften thick, coarse hair and reduce ingrown hairs. INTIM CARE works on all hair colors including, blonde, red and gray hair. It is also effective on all skin colors with no chance of hyperpigmentation and no contraindications.